Kevin Keegan once suggested that going to watch Newcastle play football should be pure entertainment for locals “It’s like the people down South going to a theatre”. Finally, more than ten years after that assertion the Toon have got their hands on the right performer to be the star of the show in Miguel Almirón. He is your classic bums-off-seats kind of player, dazzling defenders as he conducts counter attacks at a breakneck pace, scoring from distance with his peach of a left foot and doing it all with a wide grin spread across his face. He is the kind of footballer that sees the space in front of him before he receives the ball, and is accelerating through there before defenders can react, earning his nickname anguila(eel) because he is too slippery to catch. Experience the English Premier League live! Book your European football travel now by visiting Nickes.com! The 24-year-old loves playing for the crowd, and the fans have fallen in love with him. It isn’t just the X-Factor he brings, but the results that come with it. He was instrumental in the 2015 Apertura in Paraguay picking up his second league title with boyhood club Cerro Porteño, that earned him a move to Argentina with Lanús then managed by Guillermo Barros Schelotto. Three trophies in 18 months garnered the attention of Atlanta United and Tata Martino who has had proven success in getting the best out of Paraguayans. 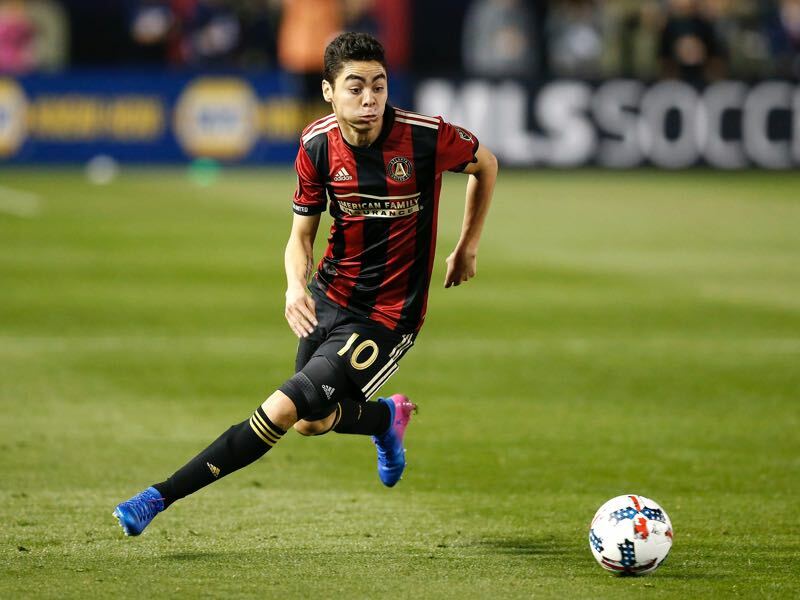 While the MLS is certainly nowhere near as competitive as the Premier League, Miguel Almirón has got a taste of the atmosphere that awaits in St. James’ Park – playing in front of over 50,000 people on average at the Mercedes-Benz Arena. The virtuoso midfielder was not intimidated by his surroundings and became the heartbeat of the side that came close in 2017 before blowing away the competition in 2018. Now he becomes the 2nd Guaraní to play for the Magpies, 19 years after Diego Gavilán was snapped up as a teenager by Bobby Robson. Becoming the most expensive player in the club’s 126-year history is a huge weight on the shoulders of somebody who nearly packed it all in at U15s level for being too skinny, although you can be sure he’ll carry the burden with a smile on his face. While he is yet to experience a relegation fight at club level he knows all about professional disappointment with the national team. Brought in as a starter by Chiqui Arce the Albirroja won 3 out of the 5 games in which he featured in as they grasped a ticket to Russia 2018 – only to see it whipped out of their hands by Salomon Rondón’s Venezuela with 6 minutes to go. Almirón had to watch that on TV, sidelined by an injury sustained in Atlanta’s title push, who knows what might have been if the talisman had been on the pitch. The same could be said back in Barrio Obrero at Club Nacional, “The other parents didn’t welcome us well there” he told ABC in a 2017 interview “I trained one day, then told my dad I didn’t want to go back, so I tried out at Cerro”. Due to sell-on clauses, Cerro Porteño stand to make over $1 million from this record-breaking transfer. The price tag and protracted negotiations proves that Benítez was intent on getting his man — Miguel Almirón shatters the MLS record for an outgoing transfer set just a few months ago by Canadian attacking winger Alphonso Davies. For a team that has relied on just 42% possession (less than all their immediate rivals in table) it makes sense to bring in somebody who thrives on the counter and who can move the ball quickly through phases. To date, only Rondón and Hayden have made more than one assist from open play this season, so it was imperative to bring in more creativity. That comes in the form of 21 goals and 30 assists in the last two years, not to mention 92 shots on target (an average of 1.35 per game). The stats don’t do justice to the beauty of it on the pitch, he is a player who gets his head up and looks to go forward, always forward. As long as Benítez remembers that “some birds aren’t meant to be caged” and let’s Almirón spread his wings, there should be some fun on the Tyne in the last few months of the season. Ralph Hannah is Londoner, who has lived in Luque and is now located in Miami, with a keen interest in Paraguayan football history and statistics. A frequent traveler throughout Latin America he attends games throughout the region and has written for a variety of publications and set up the first English-language blog on Paraguayan Football. When not in the Defensores del Chaco he’s looking after his 2 daughters. Follow Ralph on Twitter @paraguayralph.